Former London Mayor Boris Johnson holds up a Cornish pasty during the launch of the Vote Leave bus campaign, in favor of Britain's exit from the European Union, in Truro, England, May 11, 2016. The campaigns for and against Britain's European Union membership intensified Saturday, with anti-EU figurehead Boris Johnson saying the bloc's current structure was doomed to fail and pro-EU Prime Minister David Cameron warning that a British EU exit would trigger economic recession. In a Sunday newspaper interview, Johnson, a former London mayor, referenced the failed military campaigns of Napoleon and Hitler to consolidate the continent under a single government, and he accused the EU of "an attempt to do this by different methods." He then referred to "the eternal problem, which is that there is no underlying loyalty to the idea of Europe." With pre-vote surveys showing the "remain" and "leave" forces in a virtual tie, Cameron predicted a different outcome in comments to supporters Saturday. 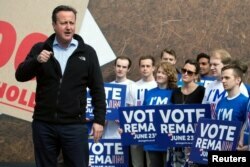 British Prime Minister David Cameron delivers a speech to supporters of the "Stronger In" campaign event in Witney, Oxfordshire, England, May 14, 2016. "If we vote to leave on the 23rd of June, we will be voting for higher prices; we will be voting for fewer jobs; we will be voting for lower growth; we will be voting potentially for a recession," he said. He then cited Treasury data estimating that an EU exit would cost British families more than $6,000 each. "That's the last thing our economy needs," he said. Britons are decidedly split on the issue of whether to leave or remain in the 28-nation political and economic bloc. An average of the last six public opinion polls shows voters evenly split, with 50 percent saying Britain should go and 50 percent saying it should stay.